As I come to the conclusion of this winter series, I felt an urge to return to my roots in watercolor and to see how my experience of the medium has changed. As I have done in the past, I did no preliminary drawing of this rather abstract design. It was painted entirely with a No. 36 Goliath Round brush. It was my intention not to get too detailed here but to use negative painting to suggest some of the natural forms and to allow the viewer to have their own interpretation. 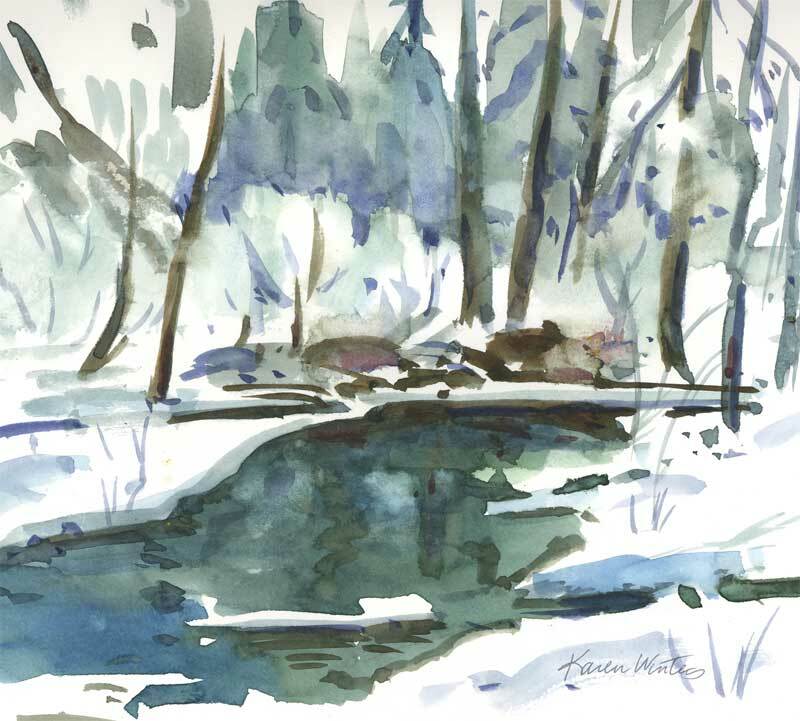 I chose to use a limited palette to reflect the subtle colors of winter – the only spot of warm is in a pile of rocks in the middle ground. Merry Christmas and the best for 2008. Karen, this is wonderful! I like the colours and the whole feeling that is evoked by looking at it! I love the water in this one. You really get the wet feeling across without being too realistic. Karen, I love those loose watercolors. Just great. All the winter scenes have been so wonderful. Merry Christmas, Karen! xox!